I took part in the concert playing one of my piece for piano and violin at maruko-bunka-kaikan. One of my works "yume-no-tsuzuki" for strings quartet was scheduled to be played at Akenohoshi Hall in Aomori in Sep 9th 2018. Im scheduling to play something with electric bass player Takashi Imai at Closing Stage of a kind of art festival being held at chino museum till July 1st 2018. Sparkle produced by Katsuhide Yamago in which i took part with music and sound design got the best editor of month award of DMOFF in May 2018. I will take part in “Inasse drama festival ” which is scheduled to be held at Inasse hall owned by Ina city in Nagano prefecture from Nov3 to Nov 4. I will take part in “gallery bird house”which is a part of "jomon art project 2017" held at Chino City in Nagano prefecture from Oct1to Oct22. I will take part in “Minna-no-Artfesta”with my works held at Shinano School in Nagano prefecture from feb11to feb12. 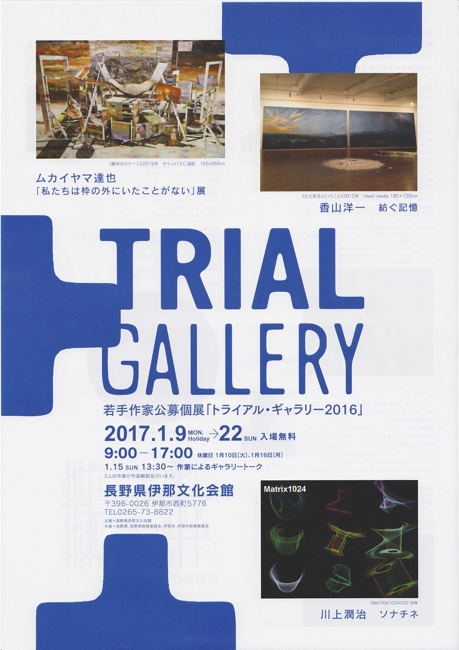 I’m taking part in the gallery of competition named 'Trial Gallery' held by Ina-bunka-kaikan from 09 to 22.Jan in Japan. Especially I display the media art using digital line expression and live motion editing with variety of music. It’s my first time of recital or presentation. Copyright 2017 JUNNI KAWAKAMI. All Rights Reserved.